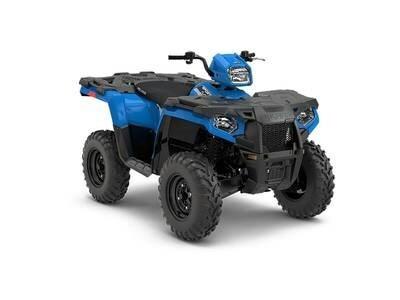 $6,999 + FREIGHT & PDI*ADDITIONAL ACCESSORIES* 2018 Polaris® Sportsman® 450 H.O. EPS Velocity Blue LEGENDARY PERFORMANCE AT AN UNBEATABLE PRICE. SPORTSMAN PERFORMANCE AT AN UNBEATABLE PRICE More power, more suspension, more hauling, more towing. While the Polaris® Sportsman® 450 has more on the competition, one thing it doesn't have is cost. Get more value with the Sportsman® 450. Features may include: POWER CAPABLE & RELIABLE 4X4 POWER The powerful engine and reliable performance you need to take on the trails or get the job done around your home and property. 33 HP ProStar® engine. Electronic Fuel Injection (EFI) to keep you moving in any weather. Electronic Power Steering (EPS) optional. True On-Demand All Wheel Drive to give you the traction you need, when you need it. SUSPENSION & HANDLING INDUSTRY'S BEST SUSPENSION & HANDLING With legendary Sportsman suspension and handling, you’ll be able to navigate the tightest corners and biggest obstacles with full comfort and control. Legendary Independent Rear Suspension (IRS) to keep you planted on all four tires. 10.5" of obstacle-dominating ground clearance. Easy-to-use single lever 4-wheel hydraulic disc brakes. Easily readable digital display. PAYLOAD & TOWING MASSIVE PAYLOAD & TOWING TO GET MORE DONE Sportsman payload and towing capacity will help you tackle the big jobs and get more done in fewer trips. Massive 1,225 lbs. of towing capacity. 485 lbs. payload capacity and a combined 270 lbs. front & rear rack capacity. Integrated durable steel tie-downs to keep everything in place. Industry-leading 6.5 gallons of water tight, sealed storage. Integrated winch and plow mount system for easy installation. DURABILITY DURABLE. RELIABLE. BUILT TO LAST. When you’re working on your property or out on the trail, you can’t afford down time. The Sportsman 450 H.O. is durable, reliable, and built to last. NEW! Our half shaft drive axles have been redesigned to increase strength and durability over the toughest terrain. Electronic Fuel Injection (EFI) for reliable cold start. Steel framed Lock & Ride® racks. STX vinyl seat for all-weather durability.